A 44-year-old male patient with chronic kidney disease underwent renal transplant from matched donor in 2004. Primary immunosuppression in the form of tacrolimus and prednisolone was used. The patient developed chronic graft rejection after seven years of transplantation and reverted to hemodialysis. He presented nonradiating pain and swelling over right lower quadrant of the abdomen along with low-grade intermittent fever and dry cough of two weeks duration. He also had loss of appetite. There was no history of jaundice, hematemesis, diarrhea, gross hematuria, trauma, lower urinary tract symptoms, or pain. On examination, he had a firm lump over the right iliac quadrant in continuation with the graft kidney which was tender to palpation. Heterogeneous mass encasing the graft kidney was identified on initial ultrasound study [Figure 1]. Contrast enhanced revealed a 10.5 cm × 8.5 cm × 8.8 cm mass [Figure 2]. The mass appeared to arise within the hilum of the graft and to spread within the renal parenchyma as well as to the perinephric space encasing the kidney. The mass was extending along the transplant ureter. There was no hydronephrosis. There was no significant retroperitoneal or pelvic lymphadenopathy. Graft renal artery and vein were encased within the mass. In addition, multiple nodules with patchy areas of consolidation were seen in both lungs. 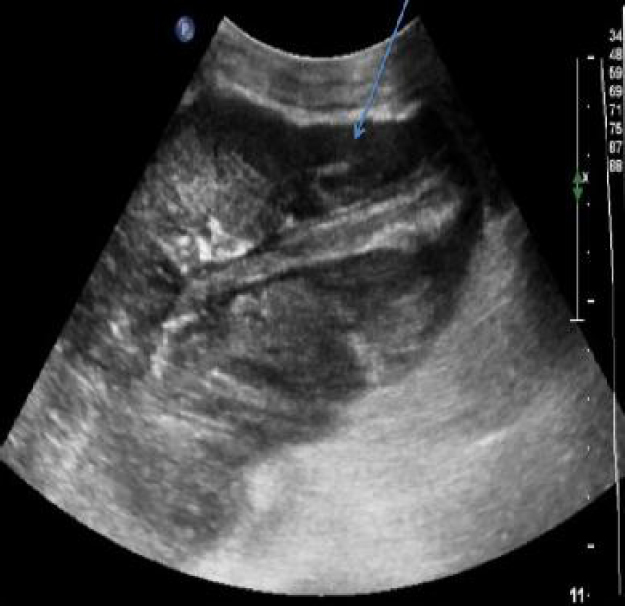 Figure 1: Ultrasonography showing heteroechoic mass encasing the hilar structures with perinephric extension (arrow). Figure 2: Contrast-enhanced computed tomography showing mass lesion involving renal pedicle and extending in perinephric region (arrow). An ultrasound-guided biopsy was performed from the perinephric soft tissue component of the mass. This showed a paucicellular tumor. 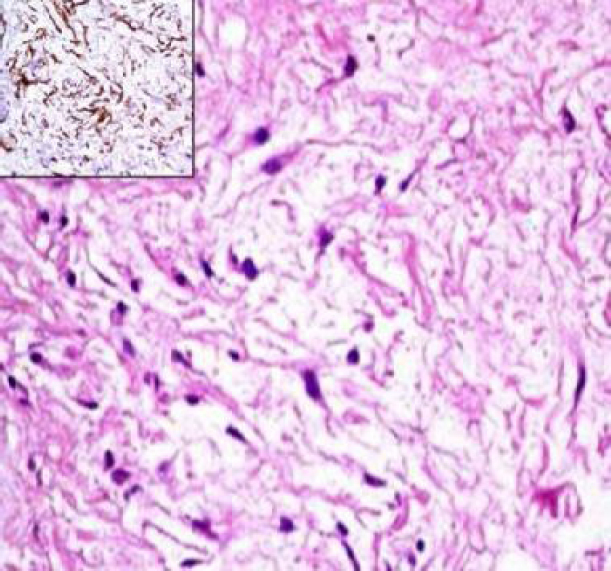 At histopathological examination, the tumor composed of stellate to spindle-shaped cells in an abundantly myxoid background interspersed with venules and arterioles. The tumor cells were relatively monomorphic and had hyperchromatic, spindle-shaped nuclei. Mitosis was infrequent. Immunostains for vimentin CD34 and S100 were positive, whereas the cells were negative for smooth muscle actin [Figure 3]. These findings suggested the diagnosis of aggressive angiomyxoma. Figure 3: Photomicrograph showing paucicellularmyxoid tumor comprising S-100 positive (inset) spindle cells consistent with angiomyxoma (H and E, ×40, Inset: S-100 antibody). In addition, he underwent fiber-optic bronchoscopy along with bronchoalveolar lavage (BAL). BAL fluid was positive for Mycobacterium tuberculosis. The GeneXpert is a cartridge-based, automated diagnostic test that can identify M. tuberculosis DNA and resistance to rifampicin by nucleic acid amplification technique. GeneXpert was positive for M. tuberculosis and negative for rifampicin resistance, thus confirming the diagnosis of tuberculosis. He was started on four-drug rifampicin-based antitubercular treatment with a plan to undergo nephrectomy for graft kidney along with the removal of tumor en bloc along with ureter and bladder. However, unfortunately, the patient succumbed to pulmonary tuberculosis while being on anti-tubercular therapy, and relatives of the patient did not give consent for autopsy. The incidence of de novo neoplasms after renal transplantation is approximately 3–5 times that in the general population. The Cincinnati Transplant Tumor Registry demonstrates that most malignant neoplasms arise from the graft kidney. Angiomyxoma is a rare benign tumor arising in a graft kidney. Differentiating among masses arising from the transplanted kidney requires a complete armamentarium of radiological tools including ultrasound, computed tomography, or magnetic resonance imaging along with histopathological correlation. Among various masses, PTLD is the most common. Angiomyxoma is an uncommon soft tissue tumor of the pelvis and perineum of females involving the vulvar and perineal region with increased propensity for local recurrence because of which it is often termed aggressive. Occurrence of metastasis is rare. It is unusual in men and primarily occurs in the scrotum or spermatic cord. 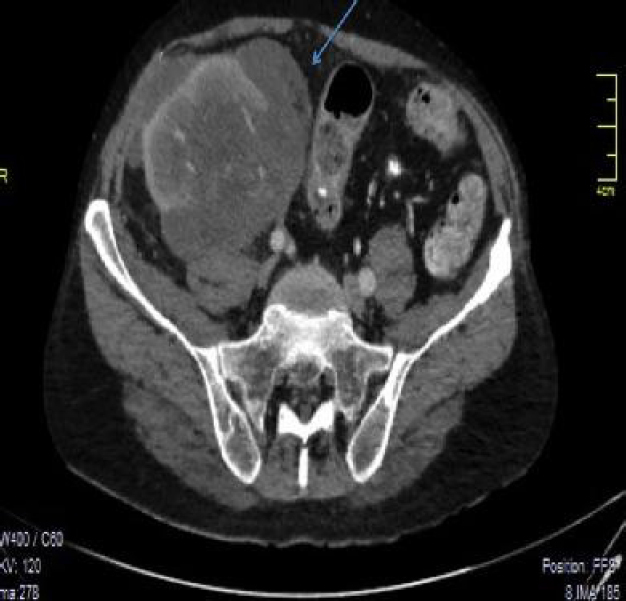 The mainstay of management of this tumor is surgical resection. To the best of authors’s knowledge, angiomyxoma in kidneys is extremely rare with only two case reports of it arising in the transplanted kidney. Diagnosis is generally delayed due to asymptomatic nature of the mass until it reaches a noticeably large size. Radiological imaging can play a role in describing the extent of the mass and differentiates among various neoplasms. Imaging appearances of aggressive angiomyxoma on CT are the presence of hypoattenuating mass, which may show the areas of enhancement, with encasement, and splaying of the renal vessels. Ultrasound reveals a predominantly hypoechoic mass. Clinical presentation and imaging features can be confused with PTLD. Review of literature showed that microscopically, the lesion is identified based on the presence of stellate and spindle-shaped cells with ill-defined cytoplasm. Multiple vascular channels are identified within the myxoid stroma, rich in collagen. The lesion is usually of low cellularity. Existence of vessels of variable size consisting of array of capillaries to large vessels is the characteristic feature which were seen this index case. To the best of author’s knowledge, this is the first case report of angiomyxoma of the renal allograft which was mimicking clinically and radiologically as PTLD. Aggressive angiomyxoma of the transplanted kidney is a very rare neoplasm in the transplanted kidney. Since this tumor presents as a mass, it should be considered in the differential diagnosis of all neoplasms arising within the transplanted kidney, especially those with clinical and imaging features similar to PTLD. Lo MC, Augustine T, Campbell B. Letter to the editor: Giant angiomyxoid tumor in a renal allograft. Transpl Int 2011;24:e79-80. Plumb A, Shanks JH, Kochhar R. Development of aggressive angiomyxoma like tumour in a renal transplant. Clin Radiol 2010;65:423-6. Morath C, Mueller M, Goldschmidt H, Schwenger V, Opelz G, Zeier M. Malignancy in renal transplantation. J Am Soc Nephrol 2004;15:1582-8. Claudon M, Kessler M, Champigneulle J, Lefevre F, Hestin D, Renoult E. Lympho-proliferative disorders after renal transplantation: Role of medical imaging. Eur Radiol 1998;8:1686-93. Gondo T, Takahashi M, Hoshii Y, Iwata T, Kashiwagi T, Ishihara T. Angiomyxoid tumour in the renal peripelvic tissues with features of aggressive angiomyxoma. J Clin Pathol 1995; 48:82-3.